We are situated within the ‘Heart of Hadrian’s Wall’ where the very best examples of remaining Wall, Forts and Bridges are to be found as well as the most spectacular views and unspoilt countryside. 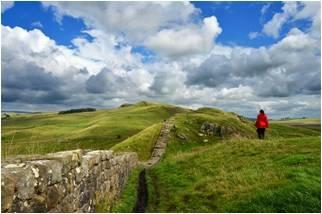 We are also on the Hadrian’s Wall Coast to Coast National Trail and Route 72 cycle way. The Lake District National Park, Kielder Forest, Northumberland National Park and the North Pennine Area of Outstanding Natural Beauty.Durham Dales and North Yorkshire National Park are little more than an hour away by car and there is a wealth of places to see plus many things to do. The Eden Valley also has a unique beauty and heritage to explore as well as Northumberland “The Last Wilderness” with historic towns, country houses and homes of the great of famous (many National Trust properties) and wonderful gardens. Also within the hour you can venture over the border into Scotland, Dumfrieshire, Roxbroughshire (via Gretna, and the Tweed Valley). The region boasts a rich historic heritage of Romans, monastics and the Border Reiving families, often visited or written about by Burns, Scott and many others of literary note. Locally there’s mile upon mile of lanes, paths and tracks to follow through farmed countryside, open fell and forestry on foot, cycle or horseback. Cycle hire, lake fishing, golf and pony trekking can be arranged for you. Carlisle is 15 miles to the west with historic sites and museums, an excellent shopping centre, cinemas and activities such as bowling, Laser Quest and Go-Karting.